A metric to quantify the amplitude of global warming is the equilibrium climate sensitivity (ECS). It is defined as the equilibrium global-mean surface temperature resulting from a sustained doubling of carbon dioxide concentrations (Gregory et. al. 2004). For decades, models have exhibited widely differing climate sensitivities: they scatter between 2 and 5°C. To predict correctly how much the Earth will warm, one must know at least (1) how carbon dioxide concentration will evolve (Boucher et. al. 2013), and (2) the correct value of climate sensitivity. Why do climate models disagree? Taken alone, a doubling of the carbon dioxide concentration would warm the Earth by 1.2 0.1 °C (Dufresne and Bony 2008). This warming induces changes that can amplify or dampen the initial temperature response through feedback processes. For example, the CO2-induced global warming allows the atmosphere to hold more water vapor. This acts as a positive feedback on the surface warming, because water vapor itself is a powerful greenhouse gas that, like CO2, absorbs and re-emits longwave radiation back to the surface. This is somewhat compensated by the negative temperature lapse rate feedback that weakens the greenhouse effect. The initial warming also reduces the surface albedo by melting snow and sea-ice, which likewise constitutes a positive feedback because snow and ice are effective reflectors of sunlight. Models agree on the sign and approximately the amplitude of these two feedback processes. The water vapor, lapse-rate and ice-albedo feedbacks in isolation enhance the global warming that would result from increasing CO2 concentrations alone to around +2.2°C. However, models disagree on the cloud response to surface warming. This is primarily why the state-of-the-art climate models produce a wide range of ECS, between 2.1 and 4.7°C. Climate models cannot simulate clouds explicitly because their dynamic scales (10-100 m) are much smaller than typical length scales of climate model grid boxes (25-100 km). Instead, clouds are represented through parameterizations that link their unresolvable small-scale dynamics to properties (temperature, humidity etc.) on the models’ grid scale. This is difficult to do and leads to uncertainties. What is an emergent constraint? To reduce uncertainties in climate-change projections, it is essential to prioritize the improvement of the most important uncertain physical processes in climate models. To achieve that, it can be helpful to identify an empirical relationship between the inter-model spread of an observable variable (hereafter named A) and the inter-model responses B to a given radiative perturbation. The variable A is called the predictor. Because observed measurements of the predictor A can then be used to constrain the models’ responses B, the relationship between A and B is called an emergent constraint (Klein and Hall 2015). The variable A may represent a characteristic of the climate system (humidity, winds,…) or may characterize natural variations (e.g., in the seasonal cycle, or from year to year). The goal is to find a predictor that, given its relation to a climate response such as ECS in models, emerges as a constraint on future projections. Several examples will be shown in the second part of this blog post. Once the variable A is estimated observationally, the emergent constraint can be used to constrain a model’s realism and can narrow the spread of climate change projections. Let’s take an idealized example: Figure 1 shows the hypothetical linear relationship between a variable A simulated by 29 climate models and a projection of future climate changes (here ECS, but in principle any climate-change response may be considered). The grey vertical bar represents observations. We see that differences in A are associated with differences in ECS. By constraining A through observations (grey bar), this example suggests that some models are more realistic (models 14-15-17-18-22) and, by inference, provide more realistic future climate sensitivities. The degree to which the models’ A deviates from the observed A can be used to derive weights for the models to compute a weighted average of the models’ response B (Brient and Schneider 2016). Figure 1 : Hypothetical relationship between a predictor A and the equilibrium climate sensitivity (ECS) for 29 climate models. Predictor A may represent, for example, a quantification of natural variability. On the y-axis, ECS may be replaced by any climate-change projection. The black line is the linear regression, and the grey vertical bar is the observed value of predictor A (with its uncertainty). Arrows show the evolution of ECS after improving the representation of predictor A for two climate models having low (4) and high (24) ECS values. If these climate models evolve following the red arrows, the relationship may have been found by chance. If they evolve following the green arrows, mechanisms underlying the relationship gain credibility. Since predictor A can be observed, this relationship can be considered as an emergent constraint. An emergent constraint can be trusted if it meets certain criteria. The most important one is an understanding of physical mechanisms underlying the empirical relationship. A way to check their reliability can consist of developing sensitivity tests that would modify A for some models (if there is a straightforward way of manipulating A). If the models’ behavior after the modification deviates from that expected from the emergent constraint (red arrows in Figure 1), the relationship may have been found by chance. A recent study showed that this risk is not negligible (Caldwell et. al. 2014), primarily because climate models are not independent but many are derived from each other. Keeping only models with enough structural differences often reduces the reliability of identified emergent constraints. However, if those sensitivity tests confirm the inter-model relationship (green arrow in Figure 1), the credibility of assumed physical mechanisms and observational constraints on climate change projections increases. 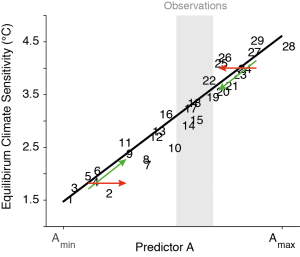 The second criterion to meet is related to a correct use of observations. Uncertainties tied to the observation of the predictor must be small enough so that not all models remain consistent with the data. This criterion may not be satisfied if observations are available only over a short time period (as is the case for the vertical structure of clouds), or if the predictor is defined through low-frequency variability (trends, decadal variability), or if there is a lack of consistency among available datasets (as in the case for global-mean precipitation and surface fluxes). Finally, the relevance of constrained climate-change projections depends on statistical conditions that characterize emergent constraints. Usually only correlation coefficients are used to quantify their significance. Yet one might ask to what extent the number of climate models and/or their level of structural differences matter. The usefulness of emergent constraints consists mostly in finding leads that help us understand and improve the physical processes in climate models that control the inter-model spread in future projections. In the next post, I will describe some identified emergents constraints and discuss their advantages and limitations.